Ireland´s probably most famous visitor attraction, the Ring of Kerry, is a panoramic road that surrounds the Iveragh Peninsula in Ireland´s Southwest with a length of nearly 170 kilometres. The loop road mostly leads along the coast trough a spectacular, almost mystic landscape. There are plenty of sights along the way, so that it´s advisable to include several days- also to combine the actual route with adjacent tours like the Skellig Ring. Having a little time or if you don´t want to drive by yourself, you have the opportunity to take a bus starting of Killarney for a day trip on the „Ring“. 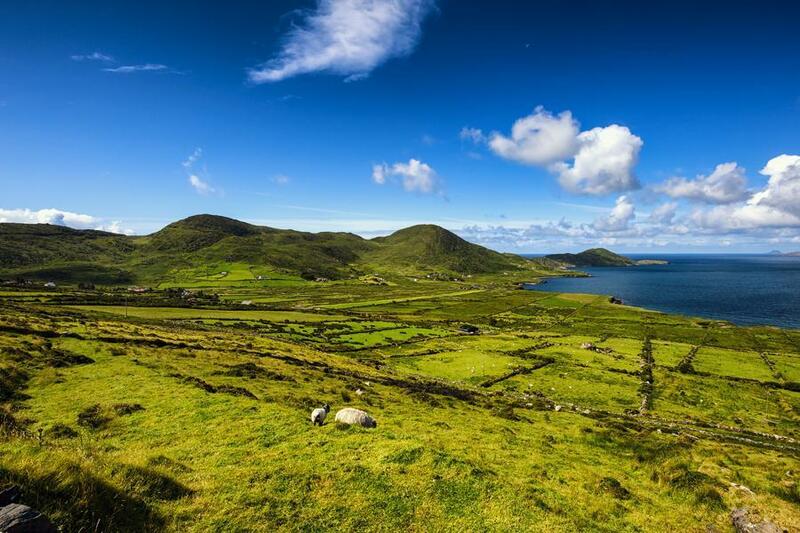 What exactly makes the Ring of Kerry Ireland´s most popular visitor attraction? The unique landscape has to be mentioned in the first place: the lakescape around Killarney, the majestic mountains in the hinterland and an unbelievable coast line. There are beautiful beaches at Rossbeigh or Derrynane, untouched nature in the outermost West of the peninsula and a magnificent panoramic view over the Atlantic. The Iveragh peninsula also allows a deep insight into ancient Ireland with a great variety of stone forts, ogham stones and standing stones. Along the route there are worth seeing villages, that preserved certain nativeness. Such as Sneem. About noon the town is entirely in the tourist´s hands, but towards evening the day´s fuss is wiped off. Then the charm of the Irish village community awakes with all its cheerfulness and cordiality. The tour around the Ring of Kerry starts in Killarney. The word tourist stronghold describes the little town very well. Leaving the town on the N71, the road winds through dense forests along the lakes of the Killarney National Park up to Moll´s Gap. On the way it´s worth to stop at Ladies View, where you can overview the Killarney lakescape. The first stop on the route is Kenmare, a market town which is quite placid compared to Killarney. The picturesque town is located in the sheltered Kenmare Bay, exactly at the peak between the Iveragh and the Beara peninsula, and is therefore an ideal starting point for visitors, who want to explore the Ring of Kerry as well as the Ring of Beara. From Kenmare the N70 leads in westward direction through a wooded area, which allows only a few glances at the sea. The forest becomes more and more dense and in a hairpin bend and you cross the Blackwater Bridge, under which the wildly roaring Blackwater River falls down into the valley. The next larger town on the route is Sneem, which is particularly popular with anglers and sailors. Straight through the town flows the same-named river, traversed by a single-lane bridge with a narrow extra lane for pedestrians. To all friends of traditional Irish Breakfast Sneem’s Black Pudding is recommended. It is considered to be the best in entire Ireland. On the continuing route you pass rugged coastal sections with small sandy beaches and uprising mountains in the heartland. At Castlecove it is recommended to leave the N70 for a detour to the Staigue Fort. Staigue Fort is one of Ireland´s biggest end best preserved ringforts and an outstanding attraction of the Ring of Kerry. At Caherdaniel another detour should be made to Derrynane. Here stands an easily accessible ogham stone. Shortly after, you reach the former mansion Derrynane House, the ancestral home of one of the Irish Republic´s outstanding political figures Daniel O´Connell. During the continuation of the journey to Waterville you pass one of Ireland´s scenically most beautiful coastal sections. In Waterville, where Charlie Chaplin regularly spent his holidays, it´s worth visiting the Lough Curraine in the hinterland- a paradise for anglers with large fish stocks. Who has enough time, should make two detours from Waterville, that couldn’t be more different: one leads to the heartland to the “Kerry Highlands”, the other one is a looped tour- the Skellig Ring. Passing through the popular holiday resort Ballinskellings the Skellig Ring leads to the gorgeous St. Finan´s Bay and onwards along the steeply increasing Coomanaspig Pass down to Portmagee. The boats to Skellig Island set off from the little fishing village Portmagee an absolute highlight of every Ireland-trip, as long the tides allow a passage. Furthermore Valentia Island, another gem in the Southwest, is reachable across the bridge at Portmagee. Back on the Ring of Kerry, Cahersiveen is the next stop. In close vicinity of the city there are two well-preserved ring forts and the ruins of Ballycarbery Castle to visit. 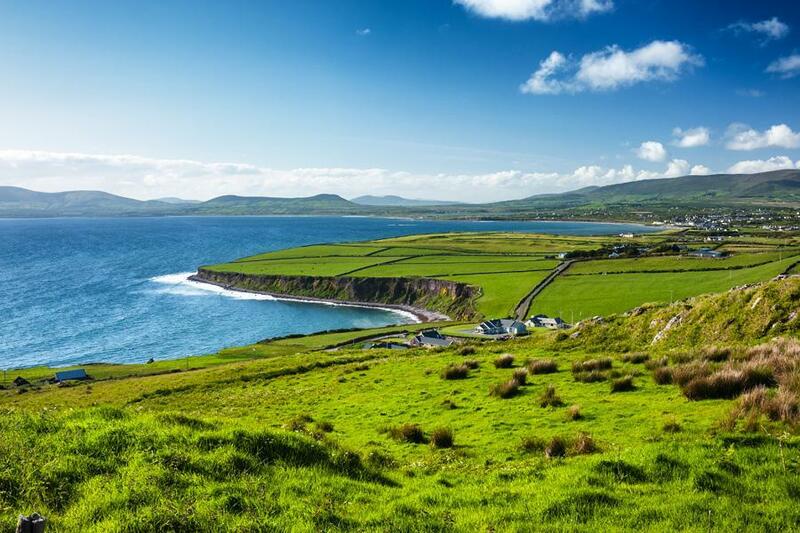 For a short while the continuing journey leads through the heartland, until Kells, where it is again possible to enjoy a panoramic view over the sea. In 2006 a park with subtropical plants and various theme gardens opened in Kells. The influence of the Gulf Stream is easily recognizable from the lush flora. Another scenic highlight, the spacious beach of Rossbeigh, is located near Glenbeigh. Here extends a narrow dune landscape over several kilometres into the sea. Shortly after Glenbeigh one reaches Kerry Bog Village, an open-air museum, which provides an insight into the life and work of Irish peat farmers. On the continuation of the journey to Killarney the road leads to Killorglin that lies idyllically at the Laune River. Killorglin is known for a three-day fair, the “Puck Fair”, that annually takes place in August. Up to 100.000 visitors come to the city, which is in a state of emergency during the festival. The highlight of the event is the coronation of a goat as a king. “King Puck”, that´s the official title of the horned quadruped, has to rest three long days at the market place, until he´s released again. The origins of the festival supposed to go back to the pre-Christian past of Ireland and are linked with the Celtic feast Lughnasa, the harvest festival. The tour ends again in Killarney, where it has begun. By the way, it was agreed years ago that all buses travel the route anticlockwise in order to avoid difficulties in mutual passing. Car drivers are recommended to drive the route contrarily, that is clockwise, in order to avoid obstructions caused by the coaches. The roads were widened visibly in the last years and are in immaculate condition today. There are only a few road narrows. So distraction because of the uniquely beautiful landscape should be the largest danger while driving.